These lovely hedgehogs are potential parents for a baby you may be able to take home! These hedgies are not for sale, as they are our babies, and part of our family. What a looker this sweet boy is! He is the complete package-- markings galore, temperament and conformation, and solid, healthy bloodlines. He is an absolute delight-- loves cuddles and kisses, lets me rub his tummy, and is an eager explorer. He is a great "ambassador" for his species, and we're just smitten with him! "Prickle-pear", as we've taken to calling her, is fearless! She has the silliest personality and falls asleep in extremely comical positions. 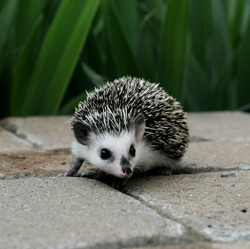 She is one of those hedgehogs that likes everyone, and is a fantastic cuddler just like her mother.